12/15/18 Adult fully trained female is available for sale to a hunting home only. Please email us if interested. 05/21/17 Our website finally has been repaired! Will be bringing 2 female puppies from Moscow: black and marble black. Born 02/10/2016. Here are pictures of mom and dad. Other puppies are available for import, male and female, black/tan, black, tan, marble-black, marble-tan, marble-black/tan. Website technical difficulties are being resolved and we resumed updating its content! There are no litters for sale right now, but plans are in the works. In the mean time, we can help you import a puppy from great bloodlines from Russia! The process is smooth and price is reasonable. If you are interested in a puppy, please submit the Puppy Information Request Form and/or email us for more information. A litter of black/white and brown/white puppies was born on March 8, 2011! For more information please go to the Breeders page. We can also help you import a puppy from great bloodlines from Russia! The process is smooth and price is reasonable. A litter of puppies is expected late January, 2011 and another mid-March! For more information please go to the Breeders page. Because of some technical difficulties, our website updates have been stopped. We will resume updating it as soon as these issues are resolved. Sorry for any inconvenience it causes! We do not have any local litters for sale right now, but we are putting together a waiting list for the next breeding to take place within next 6 months. We can also help you import a puppy from great bloodlines from Russia! The process is smooth and price is reasonable. Contact us via email or submit the Puppy Information Request Form if you have not done it before! Two litters of puppies (total of 3 males and 3 females) were born late August / early September! For more information please go to the Breeders page. A male tan-and-white puppy available for import right now! If you are interested in a puppy, please submit the Puppy Information Request Form. A litter of puppies was born in NJ on June 13! Only 1 puppy left, so hurry! See pictures on the Breeders page. If you are interested in a puppy, please contact us via email. Our Puppy Information Request Form is not working! If you have submitted one and have not recieved a reply from us, please send us an email (we can't access any requests since the beginning of July). This news column will be updated as soon as we repair the form. A litter of puppies was born in NJ on June 13! See pictures on the Breeders page. 5 year old female Russian Spaniel is up for adoption. Take a look at available and expected litters for import here. Great bloodlines! RSC members, please join the meetings discussion on the forum! Many litters available this spring. Due to airlines temperature restrictions, it is close to impossible to ship puppies from Russia during the summer months. The only location we can attempt to ship to is Toronto, Canada. However, if you know someone who would be traveling from Moscow and willing to bring a puppy in the cabin of an airplane, we will me more than happy to assist you with locating a puppy. Otherwise, we all have to wait for litters born in mid-August or later. UPDATE: Welcome to North America, Karissa Maia! Another young member of our club flew from Moscow to BC, Canada to join the Sokolova family this summer. Take a look at available and expected litters for import. Great bloodlines! The process is smooth and price is reasonable. We might have an opportunity to bring a puppy to US with a carrier, which is less stressful for the puppy and cheaper for the owner. Please let us know if you are interested ASAP. UPDATE 3/17/08: Stiv-Chesney (a.k.a. Timur) has arrived to his home in Juneau, AK and two more puppies Dash and Azor-Zhurdan (a.k.a. Nicholas) are getting ready to fly to US. 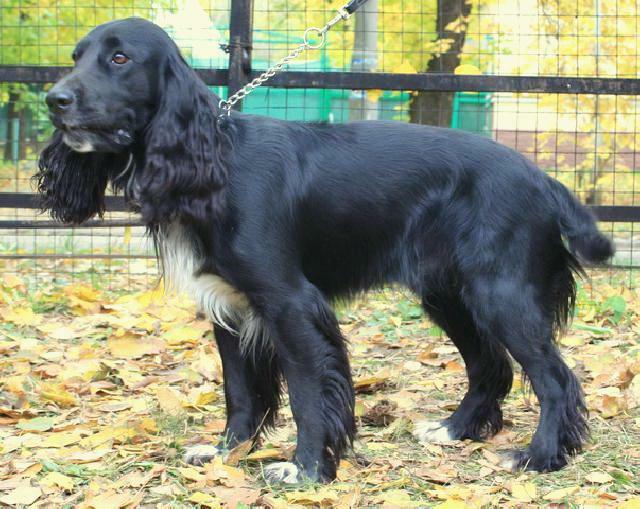 5 year old female Russian Spaniel is up for adoption in St. Petersburg, Russia! Two puppies still available in AZ! See pictures and information about the parents on the Breeders page. Puppies available for import. See pictures here. 4 year old female Russian Spaniel is up for adoption. Fine porcelain 5.5" figurine of a Russian Spaniel (the club's logo) can be purchased from the club. Limited supply. Please email us if interested. Makes a great gift! A litter of puppies was born in AZ on April 4! See pictures and information about the parents on the Breeders page. NEW PICTURES! A litter of 4 puppies was born in WI on January 18! See pictures and information about the parents on the Breeders page. UPDATE: Sirius-Natasha (OR), Sirius-Bim (IL) and Sirius-Forrest (MI) are home with their new owners. Sirius-Sofiya is going to be a playmate to her Mom and will stay with Koepke family in WI. Puppies are available for import from different clubs in Russia. Visit the Puppies To Import page and let us know if you are interested in one or in an upcomming litter. UPDATE: Three puppies are arriving to their homes in US from Russia on 4/7/07: Stiva-Blanka (a.k.a. Ginger) to NY, Stiva-Charodejka (a.k.a. Dejka) to NC, and Bari-Chaikovsky (Chai) to CA. Welcome home!!! Also, Char-Batist is waiting for his trip to US as soon as he is old enough. Your family in VA awaits you! A litter is expected in WI late january! More information about the parents and links their photos can be found on the Breeders page. 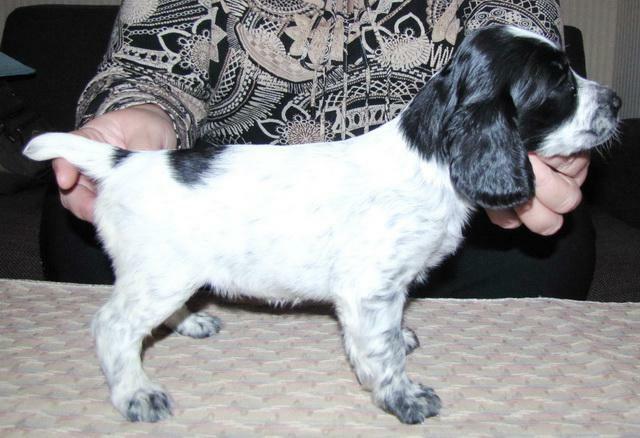 Great litters listed on the Puppies To Import page. Let us know if you are interested in a puppy or an upcomming litter. Only one marble-tan male puppy is for sale in the US. He was born on 8/22/06 in Houston, TX! Most recent pictures are here. More information about the parents and links to other photos can be found on the Breeders page. UPDATE: Tosha joined his new family in Los Altos, CA. Only two marble-tan puppies (male and female) available from the litter born on 8/22/06 in Houston, TX! More information about the parents and links to most recent photos of the puppies can be found on the Breeders page. UPDATE:Female puppy was named Tasha Elena Emery, and she went to her new home in Florida! Welcome to the club! Two litters were born on 8/22/06 in the US! 6 marble-black and marble-tan puppies in Houston, TX, and 6 marble-black and marble-brown puppies in Los Angeles, CA. UPDATE: All puppies in California litter and four of six Texas puppies are sold! Welcome to the club, new owners! Litters are expected in Houston, TX and Los Angeles, CA mid to late august! More information here. Great litters listed on the Puppies To Import page, and demand on these is huge, so please let us know if you are interested in a puppy or an upcomming litter ASAP. UPDATE: All three puppies have landed safely and joined their families in PA, OH, and ALB/Canada. Welcome home! Updates on the Puppies To Import page!!!!!!!! UPDATE: We are expecting the arrival of Borisacha, Bella and Rajs-Betty on the US soil in early august!!! There are MANY VERY INTERESTING LITTERS!!!!!!!! UPDATE: Welcome Ceya Lucy and Daphni to RSC!!! We have a beautiful brown-and-white female puppy urgently looking for an owner. Just look at her! This girl will be ready to go home mid-april. Contact us ASAP if interested! UPDATE: Gracie is on her way to her new family in Canada! We established many new contacts with excellent clubs around Russia that will be willing to sell us a few puppies. These are great quality dogs we did not have access to before now! Many very high quality litters in Russia are ready to sell, and more expected. You need to reserve a puppy ASAP, as local buyers are quick! Only one male marble-black puppy left in MD! Pedigree information and pictures of parents and puppies are here. Ready to go home now. UPDATE: All puppes have been sold: 1 in VA, 2 in MD and 1 in TX! A number of litters was born in Moscow and expected through February. Please reserve a puppy now! UPDATE: We are expecting Linda's Sir Copper, Bari-Cheena, and Bari-Champion to arrive early March to MN, AL, and CAN-ALB respecively. Welcome to the club! Accepting deposits on the litter of 4 marble-black puppies born on November 4th in MD. Pedigree information and pictures of parents and puppies are here. UPDATE: 3 of the pups found homes. One male still for sale. UPDATE: There will be no puppies from Belashka Dina and Timothy. Will try again next cycle. Sorry. Female 10 month old pup for import from Perm. Already with basic hunting training started. Please contact us ASAP if interested. Picture here. UPDATE: The dog was sold locally. A black-and-white male is for sale in NJ. Imported from St. Petersburg. Great pedigree. Available to take home on November 24, 2005. Information and pictures here. UPDATE: Ruslan found a home. We welcome Delia Radovich of Chatham, NJ to the club! A litter of marble-black puppies was born on November 4th to Fedya and Basya in MD. There are 3 males and 1 female. More information and pictures here. UPDATE: There is already a waiting list on the female. All males are still available. A rare opportunity to get a puppy from Siberia!!! The dogs near Ekaterinburg are known for excellent exteriors and exceptional hunting abilities. Only 2 males and 2 females remaining from a litter of 9 tan-and-white puppies. Ready to fly home! Contact us if interested before all puppies are gone. Every day counts! More info on this and other litters is here. Please submit a Puppy Request Form if you have not done so before. Attention all RSC members! Please read the latest announcement posted on the forum. Very high quality puppies are available for import and more are expected soon. Litters from champions and field champions. Please hurry to reserve one! Contact us ASAP if you are interested! 08/11/05 URGENT: A 4-month old male puppy Ricci is ready to go home, but due to personal reasons the original buyer can not take him. The puppy is partially paid for, and in need of new owners ASAP!!! His pictures are here. Please email us if you are interested. UPDATE: Ricci has found new owners! He is flying to Woodbury, MN to joing the Nelson family. 05/04/05 First meeting of the RSC will be held on Saturday, June 25, 2005. Details are posted in the forum. UPDATE: The show went very well! Pictures can be views here. Puppies are available and more litters upcoming. Details are here. Contact us if you are interested! URGENT: A 21-month old female is up for adoption. Details are here. Please email us ASAP if you are interested. Many litters are born late winter/spring in Russia. You will find details and pictures of available and upcoming litters here. Wonderful dogs! Great bloodlines! Please let us know if you are interested ASAP! Attention Texas buyers! Someone will be flying from Moscow to Houston late March, and could bring a puppy or two with him on board of the airplane. Cheaper and easier on the pups! If interested, lets us know right away!!! Wonderful puppies from Moscow clubs MOOiR and Dinamo are available for import! A number of very interesting litters is also expected soon in Moscow, St. Petersburg, Tambov, Ekaterinburg. Great bloodlines! Please let us know if you are interested ASAP! Update: Chase is now home with her family in MT. Nyuta and Lucy arrived safely in IL. Welcome home little girls! Wonderful puppies from Samara, Nizhny Novgorod, Tambov and Moscow are available for import! Look at details and pictures. A number of very interesting litters is also expected soon. Great bloodlines! Nattie from Moscow (club MOOiR) is reserved by Hal Cohen of West Grove, PA.
Take a look at available and expected litters for import here. Champion bloodlines! The process is smooth and price is very reasonable. Update: Three female puppies are on the way to their new owners: Natasha Lara, Nadya Sofiya, and Nataiya (aka Lady). Welcome to the club! Just found out about this great litter! 1 marble-black male, 1 marble-black female and 1 tan-and-white female available. Sire has conformation awards from the regional shows and Dam has awards from National shows! Both are working dogs with field diplomas. Puppies have to fly out of Russia no later than 10/09! Please let us know if you are interested ASAP. ! Update: Marble-black female is now owned Sarah Sumpolec of VA, and the black-and-white male is owned by Robert Montuori of CT. All other puppies were sold locally. A litter of 5 (with 1 marble-black male, 1 tan-and-white female and 3 marble-brown females) is for sale to import right now. Dam - Ida, Sire - Grey. Please let us know if you are interested ASAP. Pictures ARE AVAILABLE here. Long list of champions on both sides! 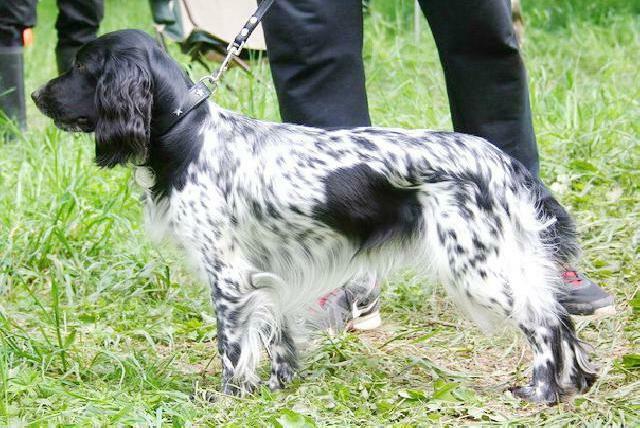 Update: Marble-brown female is now owned Lina Mukina of FL, and the tan-and-white female is owned by Gudrun deLutz of CA. All other puppies were sold locally. 06/26/04 Puppies in Houston, TX! A litters of 6 black/white puppies were born on June 13 in Houston, TX. Dam is Belashka Dina and sire is Fedya. Pictures of the parent and the puppies are here. Two litters of puppies (marble-black, marble-brown and black-and-white) are available for sale to import now. We have pictures of one of the litters. Process is smooth and price is very reasonable. Please take a look at available and expected litters here. Update: One female is now owned by Colleen Wind of MO and named Serenity. Both remaining puppies have been sold locally. 06/04/04 Puppies urgently looking for owners! Solid-Tan and Black-and-White male puppies from great bloodlines in Podolsk, Russia are urgently looking for owners. Price with shipping will be almost equivalent to that of a US-born puppy because breeders held them for us free of charge. Ready to fly to your home now. Rare opportunity! Update: Tan male has been purchased locally, black-and-white male is now named Bialystok (aka Baily) and owned by Fred Tyszka of MI. There are many litters being born this spring in Moscow and St. Petersburg. Do not miss the opportunity as breeding activities reduce during the summer and fall dramatically! Write to us if you have any questions!!!! Info about available and expected litters is here! 03/28/04 Beautiful Puppy for sale! A Marble-tan female puppy is looking for a home! Buyer changed his mind at the last minute, and now she only has 3 weeks to find someone before airline's shots restrictions begin. Adorable, very sweet and affectionate, from a field champion father and mother of other very successful field-tests dogs. Both parents have great exteriors. Just look at her pictures and video! Please let us know if you are interested ASAP. Update: Puppy has been sold locally. Tan-and-white and marble-tan puppies from a field champion are available in Moscow, Russia right now. Both parents have great exteriors! Update: Two puppies are coming to their new home in Texas. Rudi is owned by Irene Podlubny of Houston,TX and Rhonda Charlise is owned by David Whitton of Atlanta, TX. All other puppies were sold locally. Another litter of marble-black puppies are available from Rybninsk, Russia from field-tested parents with excellent exteriors. Update: Puppies were sold locally. Puppies of all colorings are available in Moscow, Russia right now. Parents have great exteriors and tested hunting abilities. Details and pictures of parents and the puppies, and info about other litters expected are here! More pictures will be added soon. Do not miss the opportunity as it is not very often such a selection is available at the same time! Update: Puppies are sold out. Two girls: Pasha (PA) and Plutishka Liza (IL) and one boy Pyotr Puusk (NM) are arriving to their new homes in the US. Welcome to the club! Brown-and-white puppies (born 11/25/03) are still available (3 of 5). Would arrive to your home 02/02/04! Parents with great exterior and hunting abilities. Update: Frantiska Anya arrived safely to her new home in McAllen, TX. All other puppies have been sold locally. 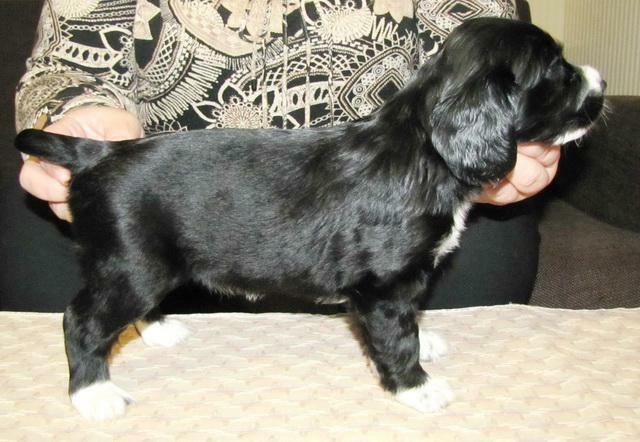 New litter of 9 black-and-white puppies (born 12/09/03) are now available. From outstanding working dogs with excellent exteriors. Would arrive to your home 02/17/04! Update: Margo Nikalena arrived to her new home in WI. All other puppies have been sold locally. 12/12/03 2 new litters of puppies to import! Brown-and-white and marble-brown puppies (born 11/25/03) are now available. Would arrive to your home 02/02/04! Parents with great exterior and hunting abilities. Note: One female was named Frantiska Anya and is now owned by Alicia Murphy of McAllen, TX. One female was sold locally, but both boys and the 3rd female are still available! Three solid black with white ties female puppies (born 11/27/03) are also available. From outstanding working dogs with excellent exteriors. Would arrive to your home 02/04/04! Note: Puppies were sold locally. A litter of 7 puppies was born on October 13th in Moscow club "MOOiR". From working parents! There are 4 males and 3 females. Puppies are tan-and-white (some might darken to marble-tan) and black-and-white. Would arrive to your home 12/22/03! UPDATE: Two marble-tan puppies have been sold to US. Niga Molly (owned by Chet Glasewski of NJ) and Nerl Nika (owned by Stephen Ramsey of IN) arrived safely to their new homes. Welcome to our club! A litter of 10 puppies was born on September 9th in Moscow club "Dinamo". From working parents! There are 9 males and 1 female. Most puppies are black-and-white, but some might darken to marble-black. From working parents! Note> puppies were sold locally. Another litter of 7 tri-color puppies is born in St. Petersburg club "Prestij". There are 3 males and 4 females. Also from working parents! Beloshka, owned by Meredith Myers from AZ. These puppies are absolutely beautiful! Welcome! We have an rare opportunity to transport 2 very young puppies in the airplane cabin with a friend of the club. He will be flying in to Houston, TX on September 20th. There are 1 male and 1 female black-and-white puppies available in Moscow right now eligible for this trip. As you might know transporting them this way saves about 1/2 of the cost. See Import page for more details. If you are interested, please contact us ASAP!!! UPDATE:Rimsky Korsakov (owned by Peggy Fitt of TX) arrived to his new home in Houston. Welcome! 08/14/03 URGENT: Puppies for importation! We just established contact with the club of Ekateriburg. They are offering puppies from working parents with great pedigree. The only catch is that breeder is ready to sell and wants a decision right away. If you are interested in importing, let us know right away! Update: Puppies Riley (owned by Kim Wolkenmurth of CA) and Raina (owned by Vicky Mathews of AK) arrived to their new homes in the US. Welcome to our club, little ones! Waiting for news on other litters. 08/12/03 New photo album of Chara Ryzhulya is available for your viewing pleasure! Chara is still in Moscow, getting ready for her flight to Chicago on august 18th. Smooth landings, puppy! UPDATE: Chara is with her family in Chicago area! UPDATE: Chara is settling into her new home, enjoying love and affection of "her humans". See new pictures in her photoalbum. A litter is expected around September 10th in Moscow club "Dinamo". From working parents! Another litter is expected late September in St. Petersburg club "Prestij". Also from working parents! 08/04/03 New photo album of Chantilly Lace is available for your viewing pleasure! 07/11/03 Puppies for importation! A litter of 6 male and 4 female puppies was born in St. Petersburg, Russia on July 4th. Most puppies are marble-black, some are black-and-white. From working parents! UPDATE: We decided not to buy any of the puppies from this litter. 06/27/03 ATTENTION! A female puppy is available for importation! Buyer backed out (decided on another breed), so the little girl is being held by the breeder without a buyer on our side. This little cutie would arrive to your local airport around 08/18/03. Contact us ASAP if you are interested at RSClub@hotmail.com. UPDATE: New buyer has been found! Maiya (owned by Alex Amit of GA) arrived safely to her new home. Welcome to our club! 06/26/03 Chelsee Baby (owned by Becky Hadley) and Chantilly Lace (owned by Brian and Fran Jackobs) flew in from Moscow. Welcome to your new homes, little girls! 06/13/03 A litter of puppies is available for importation from Nizhny Novgorod: 3 brown-n-white males and 2 black-n-white females. Both parents are working dogs. Great pedigree. Email RSC if interested ASAP! Mocha Yury (owned by Tom Mueller of FL) arrived safely to his new home. Read update on his sister above in the news for 06/27/03. 06/12/03 A Russian Spaniel puppy is in the process of importation and expected to arrive from Moscow to Illinois sometimes mid-August. Let's welcome the newest members of our club: Chara Ryzhulya (owned by John E. VanDerMeulen). 06/09/03 St Petersburg club "Prestij" is expecing a litter around first week of July, and two more breedings are planned through the summer. 06/08/03 New website ( in Russian) created by the St Petersburg club "Prestij" is now open: http://www.russ-span-spb.narod.ru . If you don't read russian, you can still enjoy the pictures from the 87th Regional Dog Show: Group I - Male , Group I - Female , Group II - Male , Group II - Female , Group III - Male , Group III - Female . 06/07/03 Two Russian Spaniel puppies are expected to arrive from Moscow to California on June 22. Let's welcome 2 newest members of our club: Chelsee Baby (owned by Becky Hadley) and Chantilly Lace (owned by Brian and Fran Jackobs). 04/08/03 Moscow club informs us of 2 litters of puppies: marble-black and marble-brown! Pedigrees are great! Champion lines! Email RSC if interested ASAP! 03/28/03 New website is up and running! 02/27/03 There is a word from Moscow that agreement is in the works between FCI and Russian Kynological Association about recognition of the Russian Spaniel breed! 02/27/03 Russian Spaniels are featured in an article! Visit Spaniel Journal website !